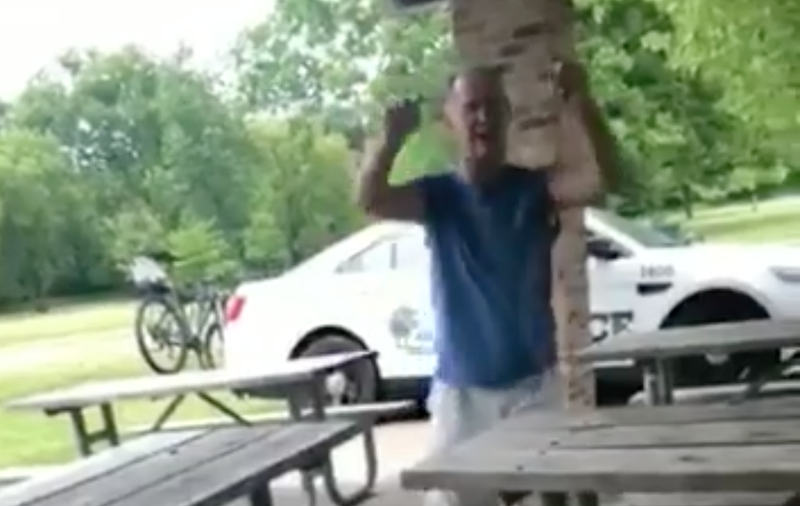 The latest viral video of a white person harassing a person of color has all the familiar ingredients—though of course, there are variations. This one stars a belligerent middle-aged white man in Cook County, Ill., aggressively harassing a woman for wearing a shirt with a Puerto Rican flag on it. Throughout the video, #MericaMax shouts, insults, and interrogates the woman, asking about her citizenship and needling her about her shirt. “You should not be wearing that in the United States of America,” he tells her. In response, the woman being harassed, Maria Irizzary, films the encounter, responding to him calmly and addressing him as “sir” throughout the exchange, likely in an attempt to calm him down. And yes, there’s also an officer involved, though unlike other viral videos where a white person calls the cops, this one is already on the scene. In the background, a Cook County Forest Preserves cop watches the encounter but does nothing, even as Irizzary implores him to help because she doesn’t feel safe. In fact, it’s not until a man comes to her aid—walking up to #MericaMax and telling him to leave—that the cop decides to intervene. According to the Chicago Sun Times, the confrontation between Irizzary and the unidentified man took place on June 14 at an undisclosed Cook County Forest Preserve. Irizzary posted a 36-minute video of the encounter on Facebook shortly after, but snippets of the video on NowThis news went viral on Monday. In the tense exchange, Irizarry informs the man that the United States owns Puerto Rico, and that all Puerto Ricans are U.S. citizens. “We don’t own Puerto Rico,” #MericaMax responds. “We protect Puerto Rico. “The world is not going to change the United States of America,” the man rants, putting “the world” in air quotes as if it’s just a concept. Irizarry repeatedly tries to stop the exchange, telling the man not to come closer and walking away from him as he continues to approach her. She repeatedly asks the officer, standing a few yards away, to intervene. “Officer, can you please grab him?” She asks as #MericaMax stalks her, interrogating her about her citizenship. At that point, the officer turns his back to her and walks away. In fact, the first time in the NowThis video the officer is seen attempting to intervene is when a man identified on the video as Irizzary’s brother walks up to #MericaMax. “Don’t you dare walk over here, OK?” He says. At this point, the cop raises his arm and can be seen talking to Irizzary’s brother. “OK, well how come you’re saying something when [my brother’s] going up, but when he was coming up to me, you didn’t do anything?” Irizzary asks the officer. The Sun Times reported on Monday that the officer in question has been placed on desk duty. On Twitter, the forest preserves also announced that #MericaMax has been charged with assault and disorderly conduct following the incident. They added that he was intoxicated. Still, many on social media have called for harsher punishment, including Puerto Rican Governor Ricardo Rossello. Roselle responded to the video, on his Twitter, drawing particular attention to the officer’s lack of action and calling for him to be fired. That #MericaMax has no understanding that Puerto Rico is, in fact, part of America, or that all Puerto Ricans are American citizens is not surprising, though given his concern about her education, it’s certainly ironic. But #MericaMax isn’t there to engage with a fellow citizen, or to learn more about a territory the U.S. has done a shoddy job of “protecting” in the aftermath of devastating hurricanes. #MericaMax, as with all the other fragile, bitter stars of these viral videos, is there to defend a perennially narrow definition of what America means and who qualifies for its protections and freedoms. And because #MericaMax has always been more protected and more valued than any other citizen, an officer stood by and gave him all the country he wanted.